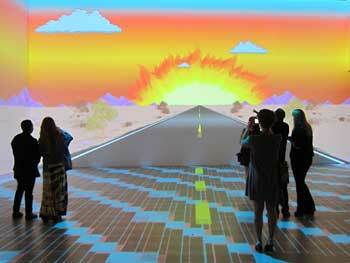 8-Bit Video Room at MOCA's Transmission LA. Museum of Contemporary Art Los Angeles festival curated by Mike D of the Beastie Boys offers 17 days of art, design, music, film and food. Mike D of the Beastie Boys curates a 17-day festival at MOCA that features a mixture of contemporary art, design, music, film and food. During the festival, find art, concerts, DJ nights, performances and installations. Dine at an outdoor pop-up restaurant from chef Roy Choi (Kogi), who will feature a different menu of original cuisine for dinner Thurs-Sat, with additional lunches on Saturdays. Also find an interactive coffee bar curated and designed by Robert McKinley. Music / DJ nights will take place each Thursday, Friday and Saturday throughout the three-week exhibit. The performances are free to enter and are on a first come, first serve basis with limited capacity. Apr. 26: Jeremy Sole and Egyptian Lover; Apr. 27: Special Guest; Apr. 28: Z-Trip; May 3: DJ Harvey and James Murphy; May 5: Diplo and Mad Decent Crew; More to be confirmed, for updates on the music series and other events, visit theavantgardediaries.com or here. Check our our Transmission LA opening night photo album featuring photos of the instillations and opening night performance by Santigold.